Uncover a hidden world of color in the North Museum’s latest exhibit, the “Rock Box. 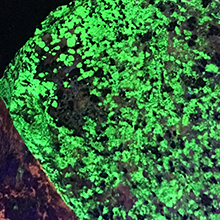 The “Rock Box” exhibit, created in partnership with ATOMIC, allows visitors to view hidden wavelengths through a combination of curated specimens from the Museum’s own geology collections, and ultraviolet light. In this specially designed dark room guests control buttons that activate bursts of infrared light. This light interacts with the carefully chosen minerals to produce a vibrant fluorescent display. Non-Members: The “Rock Box” exhibit is included in admission price. Members: The “Rock Box” exhibit is free with Museum Membership ID.